Being that today is Sunday and that means football, I decided we should have a football-appropriate snack. I decided to make Potato Skins. I don’t usually have regular potatoes because for most things I make, I prefer red potatoes. So… I decided to try and make Red Potato Skins! I turned the oven to 425° and prepped my 8 potatoes. I decided I better coat them in a little oil because I wanted the skin to get a little crispy, not soft. And I put a little Kosher salt on the skin after that. They took about 45 minutes to get soft enough. I let them cool. Besides the potatoes I had everything on hand – except chives. Not a problem. I diced up an onion and caramelized it over low heat in a skillet. But then I had an inspiration! I would throw my bacon in with the onions and add a little garlic (why not?) and add it to the soft potato mixture! When the potatoes were cooled, I halved them and scooped the innards out and put it in a bowl. Not real appetizing. Kinda dry looking. So I melted some butter (half a stick) and added it. Better… But it needed something else. Milk! And salt and pepper! Hmmm! Now I have mashed potatoes in my bowl! Did I mean to do that? Oh well! I added my (drained) bacon, onions & garlic and about a cup of shredded cheddar. I tasted it… Added some more salt. Tasted again… Pretty good!! I loaded my potato skins with my potato mixture and topped them with more cheddar (didn’t measure!) and threw them in the oven at 400° for about 15 minutes. The family went nuts over them, everyone REALLY liked them! 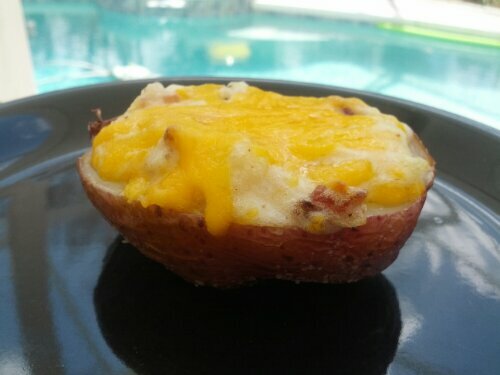 But I wonder… Did I make my own version of Potato Skins or did I just make Twice Baked Potatoes??? That’s true because they disappeared quickly!